Doing Freddy, Jason and Michael proud! 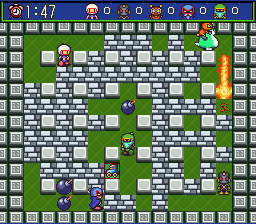 Most Super Nintendo owners know about the first two Super Bomberman games on the SNES. But what some don’t know is that the series went up to a whopping five. 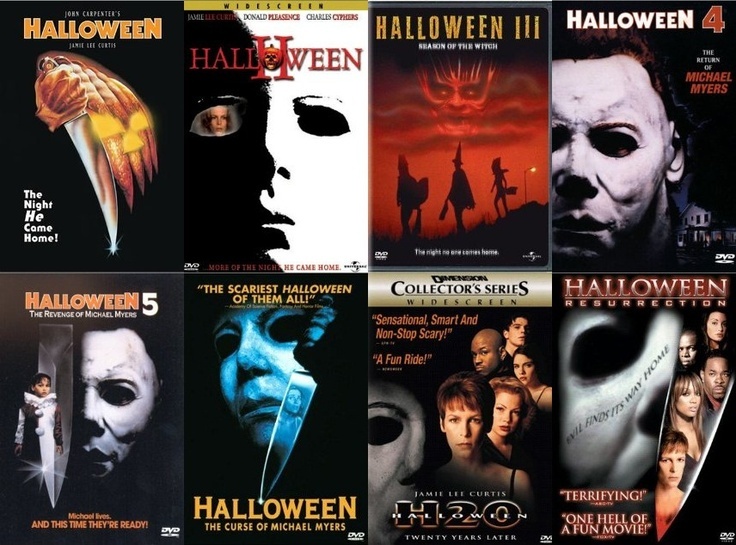 3 was released in Europe and Japan while parts 4 and 5 were exclusively released in Japan only. 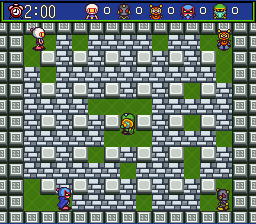 Tonight let’s look at the final Bomberman game on the SNES. It’s the fifth one, and yes, it sure does Freddy, Jason and Michael Myers proud! 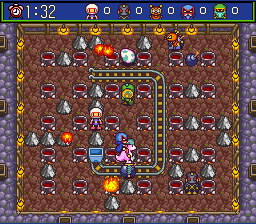 The 1-2 player mode is not shabby, although we all know by now where the meat and potatoes of any Bomberman title is. Nonetheless, here’s a quick look. There is a time warp-related plot. 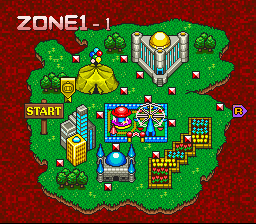 Therefore, you’ll see stages from the original SNES classic. A nice nod back to the glory days of yesteryear. 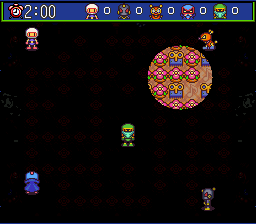 Another nice feature, at the end of each stage you’re given 3 exit points. Each one takes you to a completely different level. Sometimes you’ll select the one that takes you to the very next level. Other times you may select a stage that jumps ahead. You never know and it makes the game less linear, for sure. 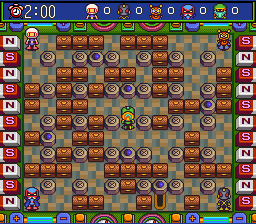 And as you might notice, some of these stages are pulled right from previous Super Bomberman titles. 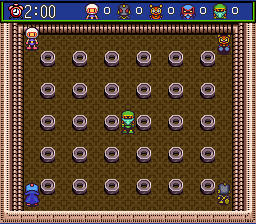 I told you there was a time warping element to this game. It’s nice to see some of the old stages from the previous games. A nice fan service if nothing else. 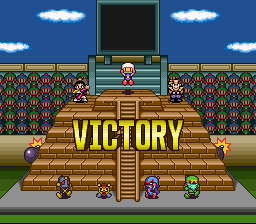 But to TRULY complete the game you have to beat all the stages. Your reward is unlocking a bonus character… a golden bomber! The first boss is rather annoying and hard. 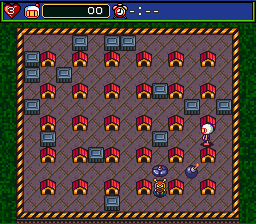 Unlike previous titles where you tackle giant machines, here the bosses are much smaller, quicker and more devious. This one drops a stealth bomb that is invisible until you step over it. Even worse, once the bomb is revealed you have only about a second to get out of the way before it detonates. I have to admit, while the boss fights are more challenging than ever before, I do miss the massive monstrosities of years past. 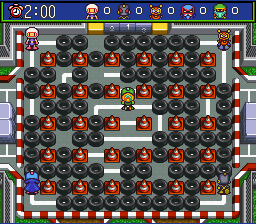 With that said, let’s get to what makes any Bomberman title shine. The essential “plain” stage. 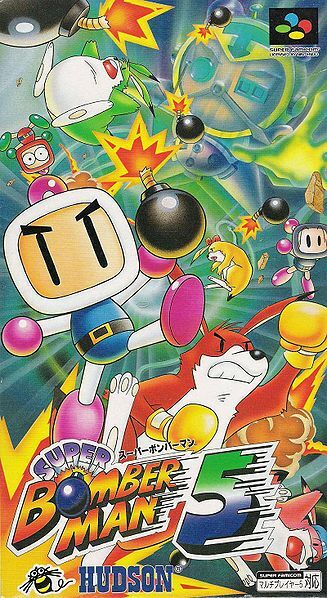 A must have for any Bomberman game. A place where no gimmicks reside and no excuses can be forged. A pure and classic battlefield. 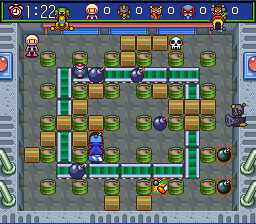 One of my favorite gimmicks, the conveyor belt sends bombs (and bombers) down the line accordingly. I really like the look of this stage. My all-time favorite gimmick: the tunnel or roof stage. Here we have lovely treetops to obscure the playing field. 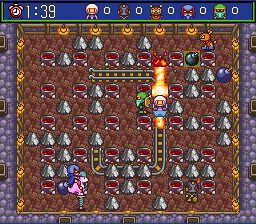 These Bomberman games have never been about impressive visuals, but I do think it’s never looked better. 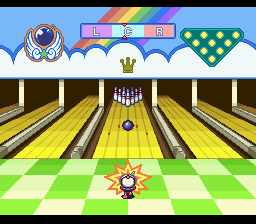 A given, considering it’s the fifth and final game on the system. 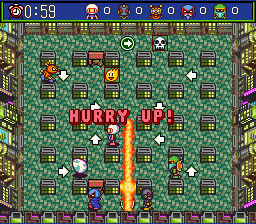 The speed stage where players move REALLY fast. Not one of my favorites, but it’s a change of pace field, pardon the pun, for sure. I like this one a lot. 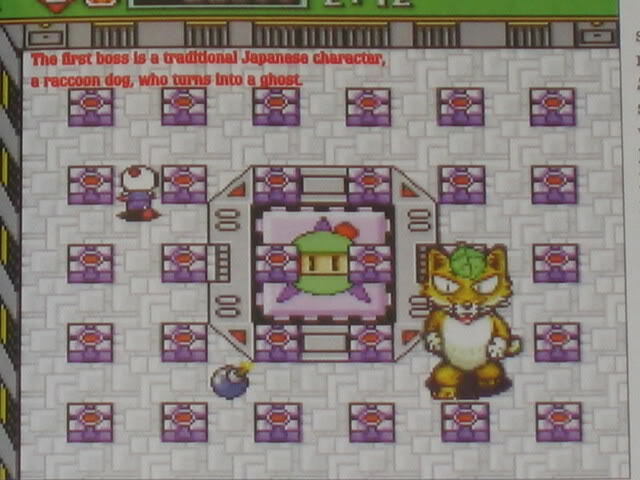 It appeared in Super Bomberman 3 and must have been so popular because it’s back. 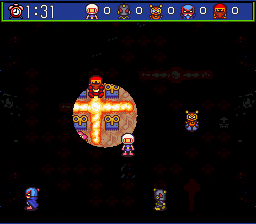 This stage has a few interesting gimmicks. 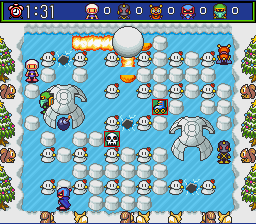 Bombs that explode under the makeshift igloos will send the top sky high. Not to mention there is slight stealth bombing capacity here. 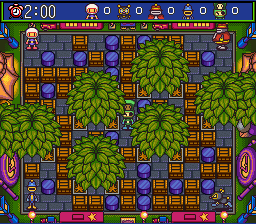 Not as severe as in battle zone three, but the potential is there (which is nice). Secondly, there are portions of the field where the ice cracks, leaving a hole in its wake. You of course cannot cross these holes. 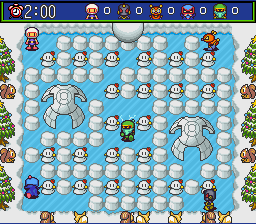 Finally, that big snowball up top rolls once you blow it up. Get the hell out of its way! It’s the arrow stage. I typically enjoy the arrow gimmick, but have to admit the look of this stage is a bit of a letdown. It just doesn’t look very pleasing to the eye. A trolley lays in the middle. You can ride it and knock out the blocks in its way. Cool stuff. You also can’t die when riding the trolley, but be careful of the landing spot. 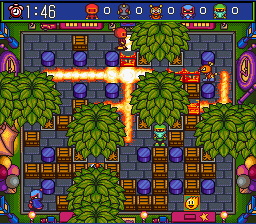 You may land right into an explosion, or you might even get stuck between two blocks. Assess the situation properly and decide whether it’s worth a ride or not. Those special knobs there will switch occasionally and possibly block you out. Not one of my favorites, but it’s adequate. 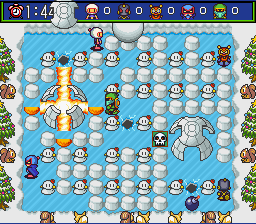 Remember this stage from Super Bomberman 2? It’s back. 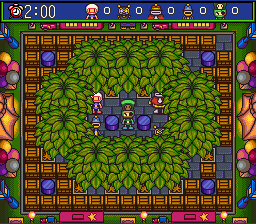 Everyone is powered up from the get go and there are no blocks. An ultimate battle of the supreme. The classic hand glove is an awesome power-up. 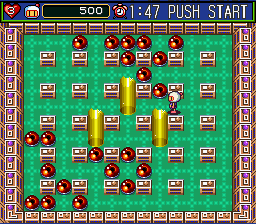 If you can find one early on when there are still a lot of blocks on the screen, you can easily kill off some rivals. Speaking of killed opponents, not only is there an option to bomb from the outside once you’re killed, but if you manage to kill someone on the field the two of you will switch places. 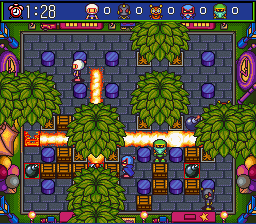 It’s a nice choice to have and adds new intensity to the mad bomber option. When the timer expires, blocks drop to the very bitter end. No longer do they close off just a portion of the field, now they drop until they’ve claimed every last life possible. This often becomes a war of attrition. If you have an animal friend and your opponent does not, this works highly in your favor. I like that animal friend there as it can jump over flames. 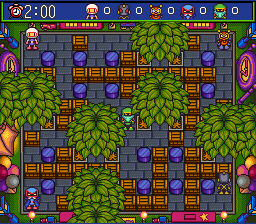 The poor green guy stands no chance! If you haven’t noticed by now, up to five bombers can play in this game. 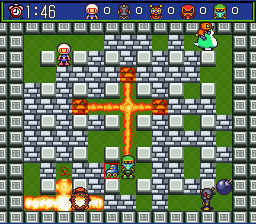 Starting with Super Bomberman 3, players went from 4 to 5. It’s nice in case you have four friends visiting rather than three. That is a hovering homing bomb. Which means it isn’t affected by the conveyor belt. 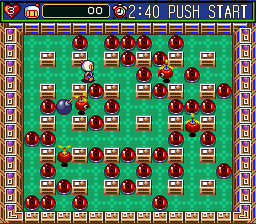 How many times have you said to yourself it would be nice if my bombs didn’t move along the conveyor belt? 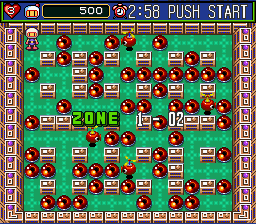 Now, with this special bomb, you can do just that. Also, it has a built-in homing device. 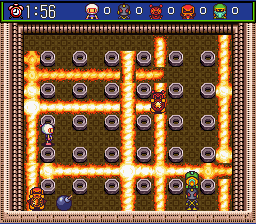 If an opponent goes near it, it will follow that person for a bit before detonating. It’s quite effective. 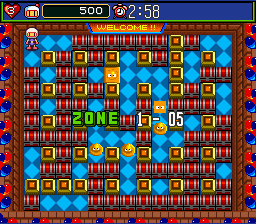 In the trolley battle zone, watch out that you don’t trap yourself between two blocks. You’ll be a sitting duck if so! 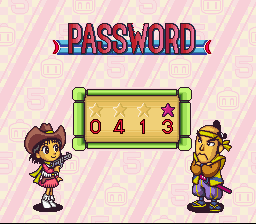 A password screen is present. There are several codes that affects the game. 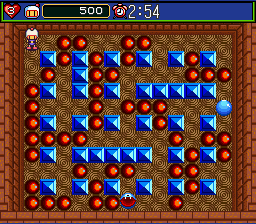 For example, the codes 4622, 0413 and 0926 change the layouts of the levels. Observe. Pretty dang cool, huh? 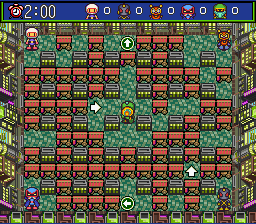 It should be noted that Super Bomberman 3 and Super Bomberman 4 also had passwords to unlock varying layouts of their battle zones as well. 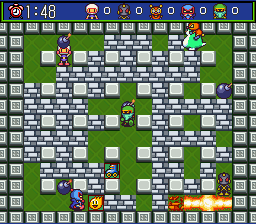 Therefore it’s not like Super Bomberman 5 was the first to do so, but that doesn’t make it any less useful. Talk about expanding longevity when the replay value was already high to begin with! This controller executes a special cheat! 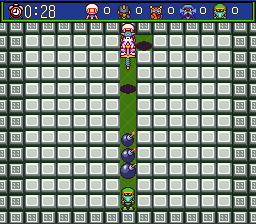 Speaking of awesome, if you own Hudson’s Super Joy Card controller pad, you can use it to activate three hidden bonus battle zones! Now how sick is that? To do so, move the blue X button over and on the title screen hold X for about 6 seconds. A sound will confirm on success. 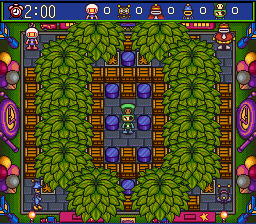 These are the same stages found on the gold cartridge — a limited edition release of Super Bomberman 5. 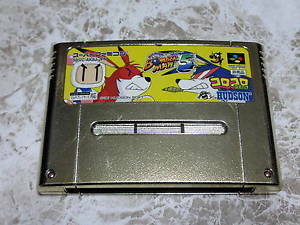 You can find gold cartridge editions on eBay for over hundreds and hundreds of dollars. So to play the extra bonus stages you can either plop down a couple Benjamins or pay about $20 for Hudson’s Super Joy Card. Yeah, I know which option I went for. 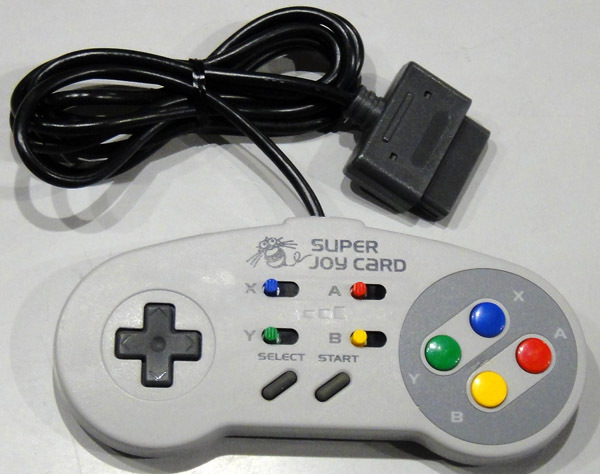 Not to mention the Super Joy Card is an awesome controller. Let’s take a quick look at the three bonus battle zones. 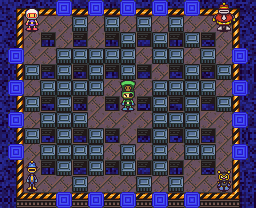 There are 18 loops surrounding the stage. Go to one and you’ll be redirected randomly to any of the other 17. Combines a conveyor belt along with tunnels. Gotta love it. Combines a trolley with warp holes. Ride the trolley and appear randomly at another warp hole. Interesting gimmick mash-up! 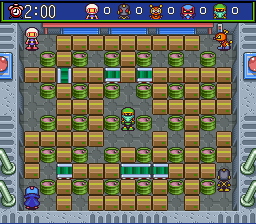 I love the Bomberman games. 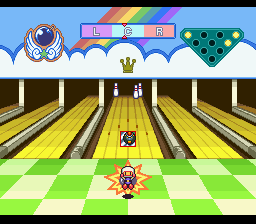 You really can’t go wrong with any of the five on the Super Nintendo. 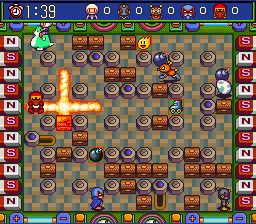 I still prefer the original out of all of them, but between parts 3, 4 and 5, I have to give the slight nod to Super Bomberman 5. I like the fact that it combines certain stages from the four previous titles. It isn’t quite a “remix” but at times it does feel like one. 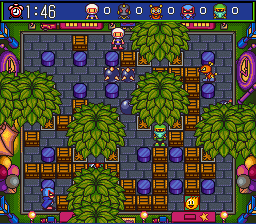 As if they took the best from the previous games and added in some new things for the fifth outing on SNES. 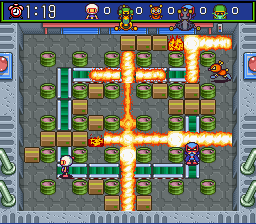 So if you had to get only one Super Bomberman title that never came out in the US, make it the fifth one. Although, why not get 3 and 4 too if you can. 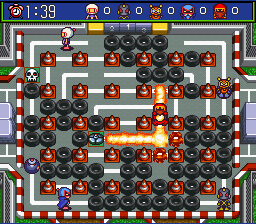 It might be overkill, but for me at least you can never have too much Bomberman. 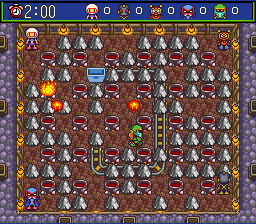 Thanks for your reviews of the Bomberman games. They were very helpful in making my purchase. 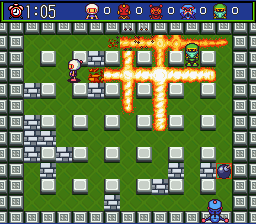 Bomberman 5 will be my first Super Famicom game.